All Branch members are welcome to attend and help sample the beer brewed specially for the occasion! 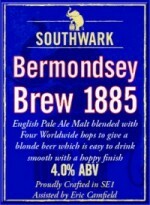 This year’s SE London CAMRA AGM is being held at Southwark Brewing at the Tower Bridge end of Druid Street on Mon 25 Jan from 7.30pm. All Branch members and friends are welcome to attend to hear about our many campaigning achievements in 2015, elect the 2016 Branch Committee, and find out how members can get more involved within the Branch if they wish to. In addition, you can help sample the beer the brewery have brewed specially for the AGM with the assistance of Branch member Eric Camfield. As if that wasn’t enough, a free buffet will also be provided!